Winter has come and gone, although the weather here in Utah would suggest otherwise. 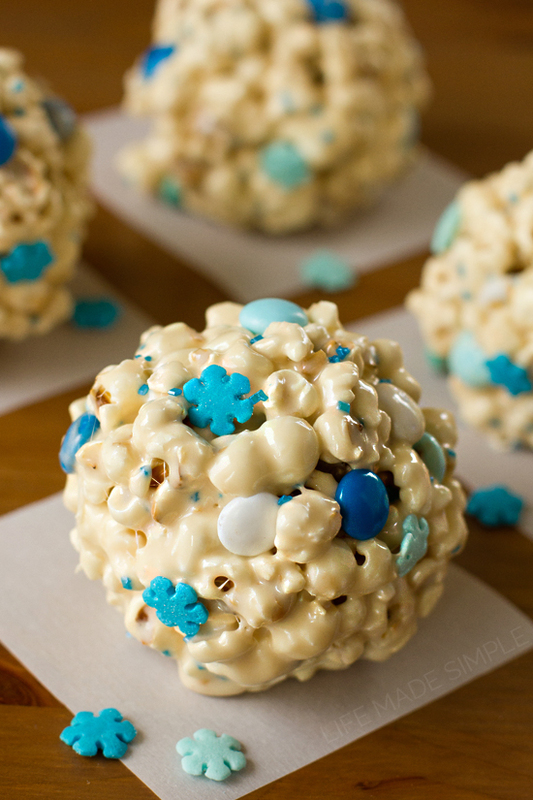 These popcorn snowballs may seem really out of place now that it’s spring, but a few days ago we had ourselves a little Frozen party. Twice a month I’m in charge of planning activities for a group of girls from our church. Every once in a while we take a break from service projects and have a “fun” day. They wanted to watch a movie and snack on yummy treats. How could I deny them? So I we ate ice cream and munched on these balls of gooey goodness while they sang and danced to Frozen. I’m usually not very adventurous when it comes to popcorn. I prefer butter, kettle or my aunt’s famous caramel corn. 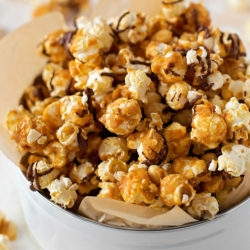 Although lately I’ve seen a ton of recipes for both savory and sweet popcorn mixes all over Pinterest. So I thought I’d get a little creative and make something new. 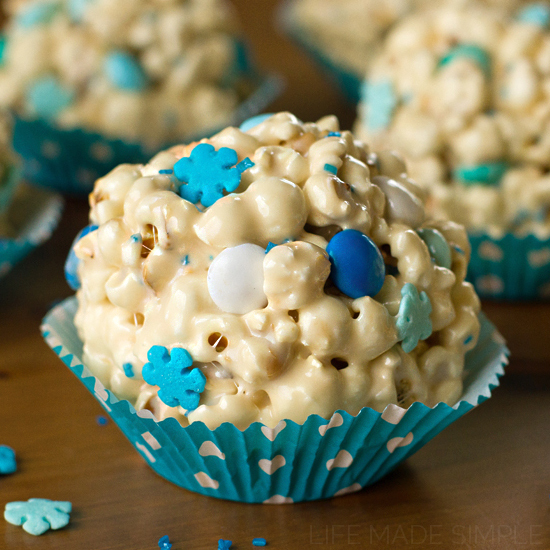 These popcorn snowballs seemed like a perfect treat for the party. I started by heating some oil in a dutch oven. I poured the kernels in, coated them and then once the oil was hot, I added some sugar. This created a sweet kettle-like base for the balls. Once the popcorn was popped I allowed it to cool in a large mixing bowl. Meanwhile I made the gooey coating. It’s just like making rice krispie treats, you melt the butter in a saucepan, add the marshmallows and then stir it all together. 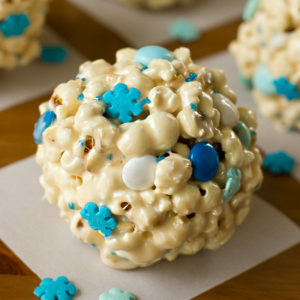 For these popcorn snowballs I added a pinch of salt and some vanilla extract. I find those ingredients to be essential in any type of baking or “candy making.” They add both depth and flavor. Anyway, like I mentioned, you just fold in the melted mallow mixture into the cooled popcorn and then sprinkle in any additional candies. Since it was a Frozen party I went with blue sanding sugar, jumbo snowflake sprinkles and a variety of blue M&M’s. To form the balls you will want to grease your hands with a little butter or coconut oil to prevent the mixture from sticking to your hands. I made (12) 3″ balls. Tightly compact them and allow them to cool/set on a piece of parchment paper for approximately 30 minutes. Once they’ve hardened a bit you can dig in! 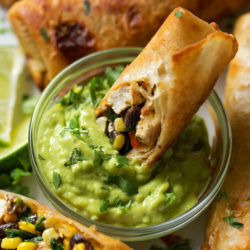 They’re crunchy, gooey and sweet- perfect for any occasion! Place them in cupcake liners and package them in cellophane bags and they make great holiday gifts. 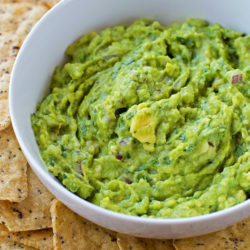 Or serve them at a party like I did, or to your family as a fun little treat! Enjoy! 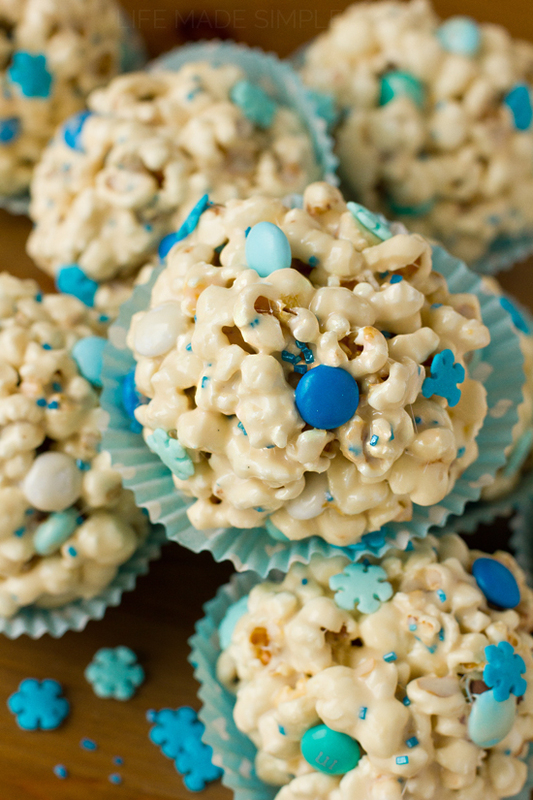 Sweet, crunchy and gooey popcorn snowballs are a delicious snack and make great party favors or holiday treats! 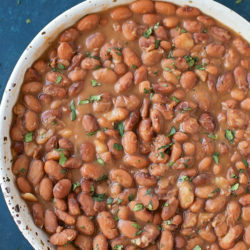 Place a heavy bottom dutch oven or saucepan over medium heat. Add the oil and popcorn and stir the kernels so that they are evenly coated. When the oil becomes hot and sizzles, add the sugar. Shake the pot or pan until the first few kernels pop. Place the lid on top and continue gently shaking back and forth while the remaining kernels pop. Once the popcorn stops, remove from heat and place into a large mixing bowl to cool. Next, in a small saucepan over medium heat, add the butter and marshmallows. Stir continuously until the marshmallows are melted. Remove from heat and add the salt and vanilla extract. Pour over the popcorn and coat evenly. Add M&Ms, sprinkles or nuts. Cover your hands with a light layer butter or coconut oil. Form the popcorn mixture into 3" balls. Set them on a piece of wax (or parchment) paper to cool completely, about 30 minutes. 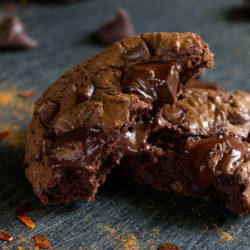 -Substitute butter for coconut oil (and omit chocolate candies) to make this recipe dairy-free. Love these. I like the idea that you can change them up to fit any occasion or holiday. Fun, fun, fun!! Thanks for sharing the recipe. Where do you get the jumbo snowflakes?? I’ve been searching and can’t find them. My daughters frozen bday is this Saturday. Help! Hi Candice! I bought them a year ago form Karen’s Cookies (they are Wilton brand), but I believe they are now discontinued. I think you can still find them on Amazon and at candywarehouse.com. I hope that helps! How far in advance can you make these? I’d say 2 days. I’ve only ever made them the day before, but they last several days. Hope that helps! Do you have to use a Dutch oven or can I use any large pot with a lid? Nope! Any large pot with a lid will do! This recipe didn’t work at all. 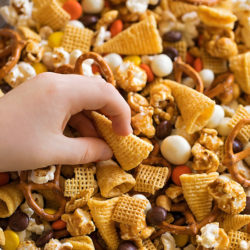 The popcorn mixture won’t form into balls and if it does, it falls apart shortly after being put down. I’m sorry you had trouble with it! I turned out just fine for me. It’s pretty much the same as making rice krispie treats, so I’m not sure why it isn’t holding together for you. I’ll definitely give it another try! 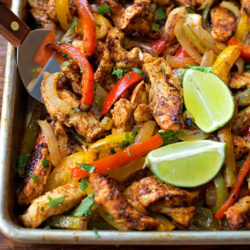 I am unable to make popcorn the hot oil way because our ceramic cooktop will get ruined by the moving of the pan (I didn’t realize this when buying our new stove….I hate it for this very reason-I love “shaking” my pans). 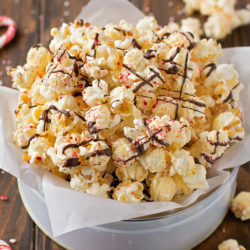 Anyway, is there anyway of doing this recipe with air popped popcorn? 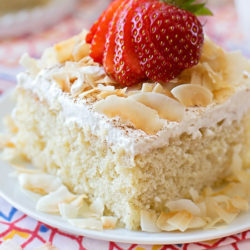 Pingback: 12 Tasty Holiday Desserts | American Financial Network, Inc. I used Rice Krispies instead, but that worked just fine. What an adorable alternative to Rice Krispie squares for my daughter’s nursery school Christmas party…ok for peanut allergic too (if you leave out the optional peanuts, of course!) which is more difficult to find than you would think! 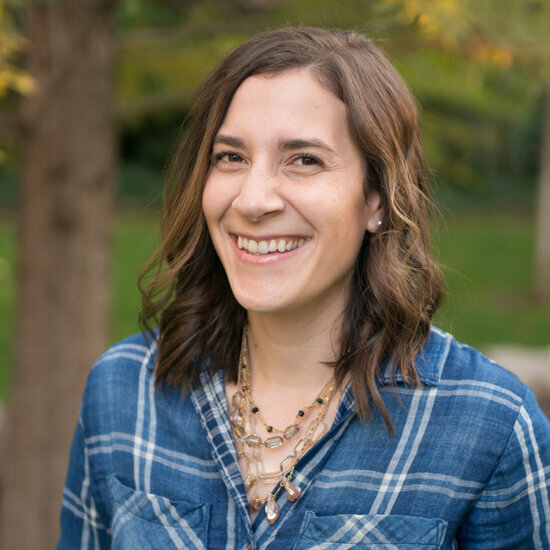 Thanks so much, Natalie! Is there any reason why mini milk chocolate balls wouldn’t work in place of the M&Ms? I’m having trouble finding the blue M&Ms for a reasonable price, but I’ve found pretty shimmer blue & white mini chocolate balls on Amazon for a reasonable price. Thank you! You could definitely use anything! I’m planning on using microwave popcorn. Can you tell me approx. how much or how many bags I may need to use? I’d say about 12 cups, maybe a little more. Hope that helps!